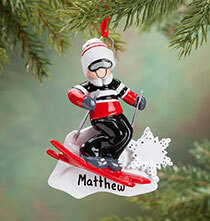 Christmas ornaments are a fun gift idea that can help bring cheer to someone special during the holiday season. 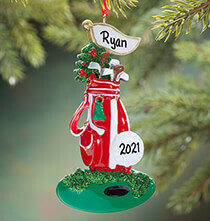 Ornament gifts make an even bigger splash with recipients when they are personalized with the recipient’s name. 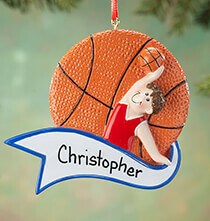 Our collection of sports ornaments offers you a choice of colorful flat, ball or figure ornaments designed especially for the sports fan. 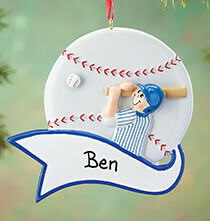 Browse to find an assortment of ornaments depicting NFL team logos or a range of sporting activities. Many young people get into sports by joining their local team. 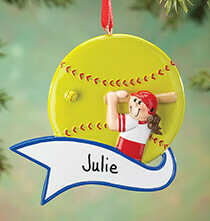 It may be a little league team, a school team or a group of kids who enjoy playing casual team sports on weekends. Being a part of a sports team is a great way to learn values of discipline, hard work and cooperation. However, teams can also help players at all levels build skills that can take them far in their chosen sport. 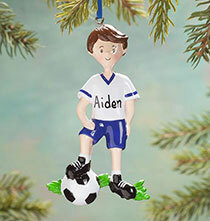 Young people playing team sports such as baseball, basketball, football, hockey or soccer may get a kick out of having an ornament that celebrates their participation on a team. 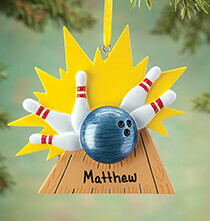 Now you can help a superfan of a professional football team enjoy the holidays with a glass ball ornament gift featuring their favorite NFL team logo. 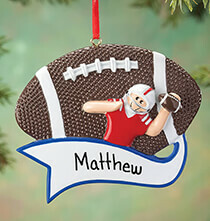 These are official NFL licensed ornaments, and each one features the team’s colors for authenticity. 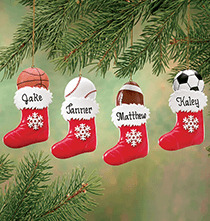 These ornaments make an exciting gift for fans and families who follow professional football. Also consider them for a coveted gift in the annual white elephant game. 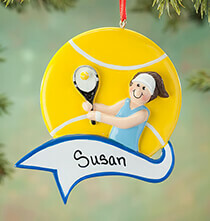 Among our collection of ornaments are those depicting athletic sports about individual achievement. 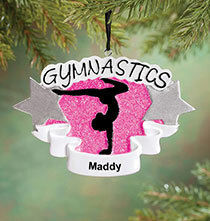 For example, a budding gymnast can take pride in her accomplishments with a personalized ornament. 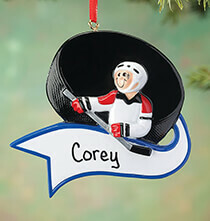 Another idea is our karate ornament, a gift that anyone working hard to earn a black belt can appreciate. Tennis and long-distance running are other examples of ornaments we carry for those aspiring to achieve a personal best in their chosen sport.